Enhance your campaign with beautifully illustrated and detailed pre-made maps! Pathfinder Maps give you a variety of full color, miniature scale play surfaces that can withstand use and virtually any kind of marker. 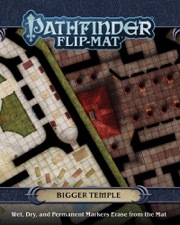 Releases in the Pathfinder Maps subscription include Flip-Mats (double-sided 24" x 30" gaming mats) and Bigger Flip-Mats (double-sided 27" x 39" gaming mats), as well as Flip-Tiles (themed 6" x 6" map tiles you can rearrange to fit your encounter). As a Pathfinder Maps subscriber, you can expect a new map every month; giving you new backdrop options for your campaign. Monthly releases alternate between the Flip-Mats and Flip-Tiles. Plus, three times per year (roughly every four months) you'll receive a Bigger Flip-Mat. With your ongoing Pathfinder Maps subscription, we'll send you each new installment and charge your payment method automatically as we ship each product. You only need to sign up once, and never need to worry about renewal notice or missed products. By starting a Pathfinder Maps subscription, each release will be automatically bundled with any other Paizo subscription items you're subscribed to releasing in the same month. 32 (out of 69) Flip-Mats are sold out, 43 if you count the (now available again) Flip-Mat Classics. 27 (out of 66) Map-Packs are sold out. I like almost every Flip-Mat i have (about 50) and regularyly use about half of them. I own 12 Map-Packs and have used 4 so far. The modular nature of the Map-Packs make them versatile in theory, but in reality they are of limited use because they are either too narrow or you don´t have (enough of) the piece you need. There are some that are very useful (like the individual boat & ship ones, mines, sewer, ice caverns and some others), but a lot of them would make more sense as Flip-Mats. Still a great product line that makes it a lot easier for the GM. Now available for subscription... subscribers get 20% off, and the ability to purchase already released Flip-Mats and Map Packs for 15% off. More subscription options can only be a good thing! :-) Though I was hoping for a way to subscribe to Flipmats only, without the map packs. Also, with more subscription options being released, do we risk our Superscriber status if we choose not to sign up for one of the new subscription options? GRRR!! Man I JUST caught up on them day before yesterday! Oh well, I think I still got the PF subscriber discount, so I believe its the same, right? OK, I'll sign up for this, I love maps! I'm pretty sure I got both discounts. That is a good question. Do both discounts stack? This question applies to botht the map and card subscription. My guess is no, but I would like to make sure. Thanks in advance for the answer! I ordered the subscription, and it puts the wizard tower in there too, and that was mailed to me yesterday. Plus how do I make it combine shipping with my PF subscription? Edit: OK. I see how to combine shipping, but how do I make sure I do not get sent the Wizards Tower since it was already sent yesterday? If you choose the flip mat, you will not be sent another Wizard's tower. I recently purchased a ALL back catalogue map packs. They look like good products, but I'm still holding out for Adventure Path PDF maps. I am all over this! Is that you Kor? We miss you! Is that the sound of James Jacobs I can hear...gently banging his head against his computer screen? Thank you so much for this. I hate having to guess what is coming out when and making sure I order it. Of course I have been nagging (hopefully subtly) for this for several months. Paizo even listens to nagging.... Thank you again. Yay! Power to the people! Yay. More people to buy maps=more map to create. I like that math. Plus, I just got my hands on the Wizard's Tower Map Pack the other day and it looks amazing! I love the map packs, great work Corey! The subscriber discount on older products is 15% off MSRP. The Pathfinder Advantage discount is 15% off MSRP. So whether or not they both apply is kind of irrelevant—either way, you'd get 15% off MSRP. I bought a few of the early map packs, but was discouraged to discover that they seemed designed to fit together only a particular way; as if permutation hadn't been a concern. For example, forest tiles that had different shades of green on opposite ends for no apparent reason, therefore reducing the ways the tiles could be matched up. I found this to be a great (and strangely unnecessary) blow to usability. Is that still the case with the newer map packs? I have this problem too, though I have noted that Sewers was very flexible as was Waterfront (the ship is seperate from the piers etc). Hopefully future map packs will be like this too. We have been working at making the maps more flexible. Sometimes it doesn't work as well, for instance the Wizard's Tower, but other times like the Waterfront, it works like a charm. Personally, I like the more modular ones myself as I tend to want to recreate various locations n adventures and the modular ones allow me to do that better. We'll keep playing with the mix. Let us know what you think. I really like Wizard's Tower, but it is more of a set piece than a set of interchangeable pieces. In other words, you only get one incarnation of a wizard's tower, not the pieces to make a number of different towers. In this case, it made more sense to make one cool tower. No brainer on this subscription. Outstanding. Subscribed. Very clever, guys & gals. Very clever indeed. First you hook me with a subscription for the item cards and now this. I too, am interested in how this might effect subscriber status. Any info from the folks@ Paizo? I'm not clear on the question. Can you be more specific? As interested as I am in a flip mat subscription, I am not that much into GameMastery maps as both map styles seem to be pretty exclusive of each other - either tiles or a full blown map. After speaking with Vic at PaizoCon, I went by Office Max to look for some sort of handy container to store my map packs. The 5x8 size is just too awkward and I didn't have any luck...if they were 5x7 then it would have been easy. Anyone with advice on how to store the map packs? The 5x8 size is perfect for our Map Packs. Terrific! Thanks Vic. When I looked around the store I didn't notice these card boxes, but they do look like they will work. The only reason I don't sign up here is that I already "subscribe" at the local game store. Along with the Alea Tools discs, these are my must-have game aids. I'd love to see more based on locations from PF scenarios. 1- what is the difference between flip mats & map packs? can you write on them both? 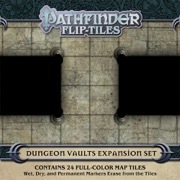 2- do any of the flip mats or map packs relate specifically to encounters in any of the modules or adventure paths & if so which ones with which ones. As for the ones that have been featured in adventures, Module TC1: Into the Haunted Forest makes use of Map Pack: Inns and Flip Mat: Woodlands. Pathfinder Module: Crypt of the Everflame uses the new Flip-Mat Dungeon. And several of the Pathfinder Society Scenarios use GameMastery maps, but I don't have a list of those. It would be cool if we could purchase thes in pdf format also. I am very interested in 20% off, but do I have to also pay for s/h every month for each pack? Yes you do but I think you still come out ahead. Where you really come ahead is if you have a subscription to another product and combine shipping every month. Then the discounts really work. So, I feel compelled to say I have been using Gamemastery Flipmats for years now. Last Monday I used the winter mountain pass and my players were impressed with the quality, durability, and overall design. This post edited, as I realized it was answered already upthread. Thanks, Paizo. Add my name to the list of people that would buy stacks and stacks of these maps if they were available in pdf format. Count me in that group as well; if we had these available in an unlocked PDF format (for use with online gaming) or even a simple JPEG format I would be willing to pay a bundle to grab them all. The map packs in particular would be very useful in a JPEG format that we could rearrange in Photoshop to create unique scenes for online gaming. At present I use some of the extremely low-res maps that Paizo publishes for advertising purposes online, and would absolutely pay for nicely detailed digital maps. The high resolution is a big aid for a GM trying to look professional, especially using a program like Maptool. Bump. Any word on this? After seeing the flip-mats used to awesome effect during PaizoCon, I am very interested in the availability of digital files of these maps for use with online gaming. Jpegs would be ideal, and I'd be willing to pay at least $5 per image file. These images are great, much better than the free stuff online, and would be worth the price. Vic, Lisa, James? Any possibility of this happening, and if not can you please explain why? I've money I'd like to spend on these, but the physical maps don't do me any good! I would like .pdfs as well--not "unlocked" to use online, but to have something letter-paper sized that I can print out and write GM notes on. Much as I love these maps, I've become frustrated that prepping ahead of time trying to use them is very difficult. One day I found myself trying to hold open the cathedral map (these things are 24x30 remember) while hand drawing its general shape and features into Campaign Cartographer so I could then use it to prep for my game session. Took me awhile to do. I bought these things to make less work for me, not more! And I will say this: without .pdfs, I am planning to cancel my GameMastery map subscription within a few months. I know the next couple maps I both need in a timely fashion and they will end up shipping with my APG and/or other stuff I'm ordering, so I will get my money's worth shipping-wise. But once those very specific things are ordered, there's nothing else I want to buy in the short term. And the maps alone--with no .pdf--are not worth the money, because I end up paying $14 including shipping, more than the retail cost, which is ridiculous. It'll be better for me in the long run to order them through my FLGS. I feel sorry for the people who don't have an FLGS to order through, though. Several of us believe that if we offered our GameMastery maps in PDF form, a significant number of gamers would choose the PDF edition exclusively over the print edition, which would mean smaller print runs for the print edition, which—since print costs are based largely on volume—would in turn mean higher costs for the print edition, which would lead to even smaller sales for it, which would mean we wouldn't have a profitable line anymore. Aw, that's EASY to answer. PDFs are only available with subscription. Then you likely have the opposite result. Though you would probably have to listen about lots of complaints about how the PDFs are not available without a subscription. To which you can answer, "that's the benefit of having a subscription."